Nicolas Cage turns out so many films per year, it was inevitable that one of them would be good. Now Cage is a great actor when he wants to be, but most of the time he is sold short by a poor script, weak direction or both. 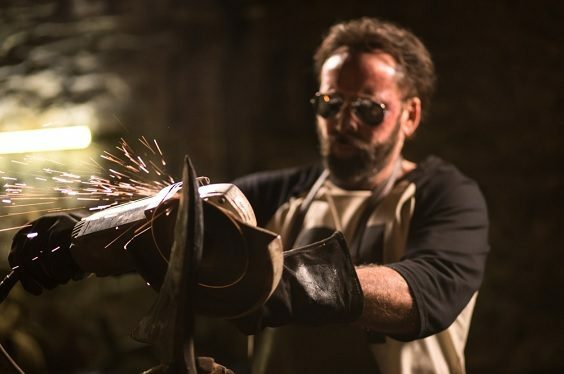 So when I heard about Mandy, the horror thriller in which he plays a vengeful lumberjack, I was intrigued. One of the reasons was the score by Johann Johansson, the Icelandic composer who gave us some stunning sounds on the Sicario and Arrival soundtracks. Following his untimely demise, Mandy became his epitaph, and what a mind-blowing film it is. Directed by Panos Cosmatos, the son of Rambo 2 director George Cosmatos, it’s a trippy, horrific and at times comedic rollercoaster ride into who knows what. Cage plays Red Miller, the gruff logger whose romance with scarred artist Mandy (Andrea Riseborough) is so touching, you know things aren’t going to end well. When she catches the eye of Mansonesque cult leader Jeremiah Sand (Linus Roache), Mandy is abducted, and Miller is left to die. So far, so horrible, but if you’re a fan of visionary fantasy horror like Hellraiser (also produced by Christopher Figg) and the locally made offering Await Further Instructions, then this mind-blowing trip to the dark side may appeal. Yes, you may think someone has slipped something in your beverage of choice as the drama unfolds, and while it may be a simple revenge thriller, the demonic bikers and Cage’s commitment to the role are eye-popping. Underscoring the experience is that unnerving Johansson soundtrack. At times it feels like slipping inside the gatefold of a prog rock LP, and getting lost in the artwork. Or it could be just another tale of boy meets girl; boy loses girl to psycho cult; boy goes on the rampage with a self-forged, gleaming axe/spear-thing. Whatever it is, Mandy is a film that’s not for the faint of heart and not easily forgotten.